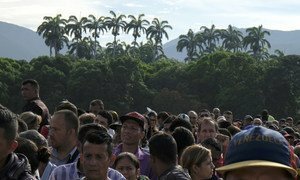 The EU and the Red Cross assist thousands of Venezuelans migrating throughout Latin America. At night, women with children are sheltered in tents, next to the Red Cross health centres. Colombian authorities give them priority to process documents and let them across the border. In a statement issued by his Spokesperson, the UN chief urged all parties to “lower tensions” in the South American country, which is riven by economic and political crisis, after deadly clashes in the capital Caracas between security forces and thousands of demonstrators opposed to the Government of President Nicolás Maduro. At this “critical” time, Mr. Guterres “urges all actors to lower tensions and pursue every effort to prevent violence and avoid any escalation”, the Spokesperson added. The development follows Wednesday’s declaration by opposition leader Juan Guaidó that he had become the country’s interim president until fresh elections could be held. Mr. Maduro was officially sworn back into office for his disputed second term, following elections mired in controversy, just two weeks ago. Issued from the World Economic Forum (WEF) in Davos, Switzerland, where Mr. Guterres gave a keynote address, his statement highlighted “the urgent need for all relevant actors to commit to inclusive and credible political dialogue to address the protracted crisis in the country, with full respect for the rule of law and human rights”. The UN Secretary-General António Guterres (r) is interviewed on Facebook Live by journalist Eshe Nelson at the World Economic Forum in Davos, Switzerland on 24 January 2019. In a report issued in June last year, the UN human rights office (OHCHR) documented “credible, shocking accounts of extrajudicial killings” during crime-fighting operations carried out between 2015 and 2017.